Lionel Messi and Sergio Aguero celebrating with Argentina. Following Argentina’s 4-0 win versus Haiti, some statistics emerged from the match. Lionel MESSI’s goal scoring run for Argentina continues and he has taken his tally to 28 different National Teams. Here are some of the statistics coming out of Argentina’s latest match. Lionel MESSI has now scored 6 goals in his last three matches for Argentina or two hat tricks in his last three matches. Lionel MESSI has now scored at least one goal for Argentina for the past 13 years. 2006, 2007, 2008, 2009, 2010, 2011, 2012, 2013, 2014, 2015, 2016, 2017, 2018. 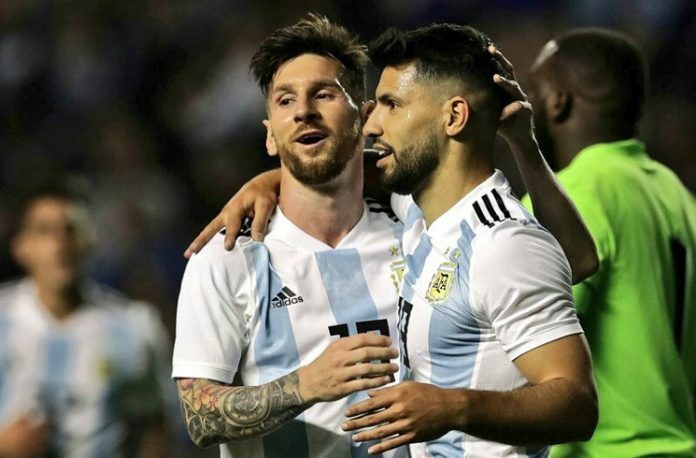 Sergio AGÜERO has now scored at least one goal for Argentina for the past 12 years. With his three goals, Lionel MESSI has surpassed Ronaldo (the Brazilian) and is now on 64 goals, just 13 away from Pele who holds the record of most goals scored by a South American for his country. Lionel Messi is now behind only Pele in most goals scored by a South American player for their country. Via ESPN. Gonzalo HIGUAÍN’s last goal for Argentina came in October of 2016. He has since played eight matches, scoring 0 goals. 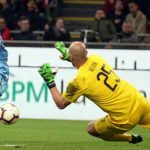 Gonzalo HIGUAÍN is at 32 goals for Argentina, two behind Diego MARADONA (34 goals) and three behind Hernán CRESPO (35). 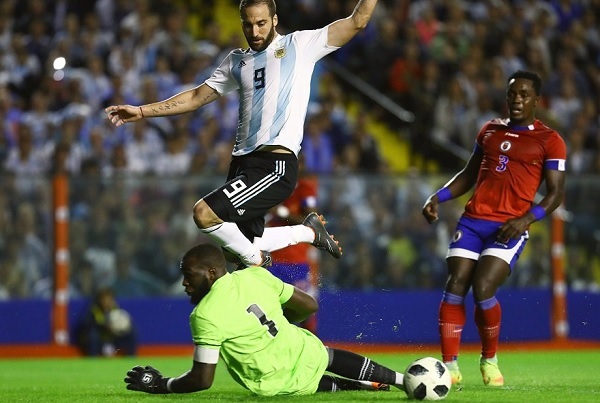 Gonzalo Higuain playing for Argentina vs. Haiti. Cristian PAVÓN now has three assists in five matches for Argentina. 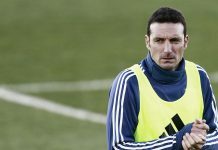 Javier MASCHERANO has now tied Javier ZANETTI fot most caps for Argentina. Both now at 143 matches. Manuel LANZINI is undefeated with Argentina having played four and won all four matches. Marcos ROJO has not won two matches in a row since Argentina defeated Venezuela and the United States at the 2016 Copa America. Since then, he has played eigh matches. His records stands at one recent win versus Haiti. We did not invite Haiti to score 7/8 goals on them. No we should have not at all. We should not have risk it. We cant afford any injuries before even playing the WC thats why Sampa chose Haiti. Not to look fancy on the scoreboard or bully the minnows. No one gave 100% yesterday. They took it easy and had a good time out there together and infront of the home crowd. So stop worrying or over analysing this game. It was a warm up and everyone had a decent stretch. Thats all. Dont Judge yet. And hopefully we will bench Higuain when the real game starts. 7 positions should now be confirmed incl benching DiMaria for Pavon. DiMaria, Banega, Dybala, Higuain would be a strong bench. One or more of them can become super subs in the knockout stage being the goal scorer or provider. Defensive midfielder is confirmed that’s biglia. I doubt so. We have not seen him perform after coming back from injury. If he is not at his best level, Mascherano would probably get the nod. For now, Biglia may have the upper hand. But such a upper hand exists in other positions too. Caballero at GK, Lanzini at RM, Salvio at RB if we go for all out attack are already the preferred option atm. I am 100% sure salvio will not be our starting rb in WC. Higuain, Di maria, Mascherano and 2-3 more players of our squad together with Leo are the players that bring the experience and the balance in the team. if some people get bored and they don t like to see them anymore then i have one advice to you guys. 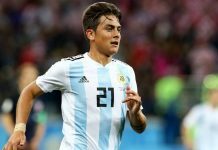 ARGENTINA have one very good U20 national team. you can find games of U20 in internet watch and enjoy that if you can t wait next summer s U20 world cup. I did not like the position of Lanzini and Lo celso. Dimaria and Gaguain are stupid. Ideally it’s great to have elegance and efficiency of Aguero and work-rate of Higuain but we all know that it’s impossible. I guess Sampaoli is trying to use Higuain as the forward of starting XI in order to make the opposite defenders tired. And then he will replace him by Aguero, Dybala or Pavon. Why not, I mean it’s similar to Guivrach with French NT in 98 and that formula may work. From what I saw, I believe that Pavon has the quality in this NT. He may be the Ribery in 2008. Great Oprinion, ortherwise no reason to take him. At the same time, Sam does not have believe on Icardi. 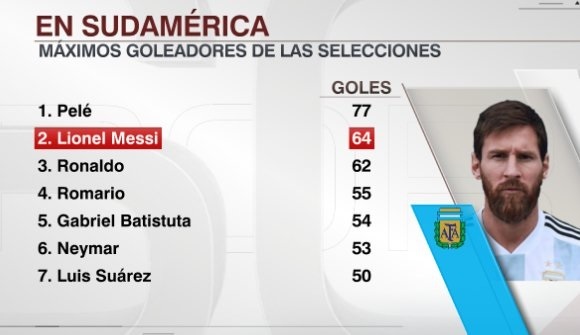 And yet Messi is outscoring all of the ‘9s in contention. When you have Leo fighting on the identity of best ‘9 won’t yield any fruit or goals. Any striker can partner Messi as long as he doesn’t stand in b/n messi’s efficiency up front. He should work his a** off like L.Suarez. The work rate, degree of understanding with Leo & an off ball movements would probably make any of Pavon/Higuein as dependable partners of Messi IMO. The man said it best. Not going to happen lol. As many who have read my comments know I do not like Higuain but the guy was in pure agony for not scoring. His face said it all at halftime as well as kicking the goal post. 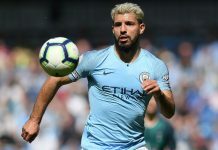 Sampaoli needs to bench him for his own good and start Aguero. 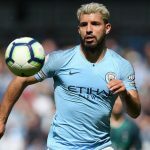 And seeing we don’t have Icardi this will be a problem if aguero can not stay healthy for 7 games. I pray that Higuain breaks through. The agony on his face was brutal. I said this many times on this forum and I say it again, Higuian is mentally broken, damaged goods, can’t cut the mustard anymore, KAPUT! And yet they freaking play him over and over again!!!!!???? Welcome to club de emigos ! defox1942: as you know I agree with you and we both have been saying this for an age. It’s probably too late but I would swap Di Maria for J.Correa and Higuain for Icardi. Fresh players with something to prove. Some have a point if they say Higuain works harder without the ball, but a number 9 not scoring in 8 matches… Ouch. Di Maria brings creativity and initiative, but his passing is below par and often he does not choose the best option. Correa will just like Pavon, work hard and offer Messi passing opportunities. Joaquin Correa is a guy with zero end product, Dimaria gives 5 times more assists than him, rather Angel Correa instead. We have soooooo many wingers in our team. Why do you need another one? San Isidro: so true and its tragic hig is still their, its also not like hes been brilliant for juv this season as he ahs not. That stat at the bottom with the chicken-head scoring 53 goals, i bet 40 were scored in garbage time against mostly garbage teams. Neymar has only 17 goals in competitive matches, 36 from friendlies. Messi has 34 goals in competitive matches. 17 days left till the game against Iceland. really i can t wait!!!!! In 2014 i supported Germany and won the tunerment, in 2018 I’m supporting Argentina. Funny fact is that Messi eliminated by Germany each and every world cup. Hope another Argentina vs Germany Final this year. You supported Germany in 2014, what are you doing here then? i am very proud as Argentinian for people like you my friend. with words like yours that touch the heart of every Argentinian. thank you for your pure support and God bless you and your country. O’ So your one of those. You dont have a regular team. I have been supporting Arg since 1990. And most of the fans in here supported only Arg. True Fans. But you are welcome here. Enjoy the site. yes . i also subscribe to this idea. It should be Lanzini – Locelso- Salvio in 4-1-3-2 . Ansaldi as RB. Challenge is our DM as a single pivot will be very tough for our options. Dimaria , pavon , meza can be the subs. Israel is far better than Haiti at least.